Frugality is an unavoidable companion throughout PhD training due to our limited incomes. For those of us who are not naturally frugal (I confess! ), it might be quite an unpleasant companion initially, one you constantly struggle with and attempt to escape. 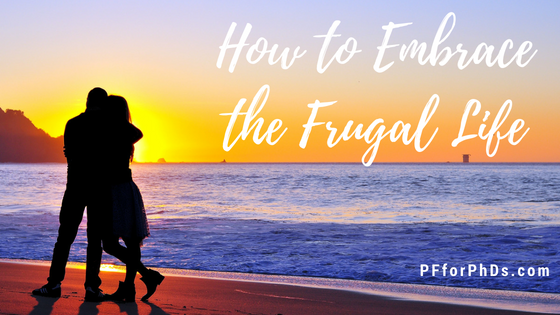 This post details six strategies to help us change our attitude toward frugality and instead welcome and embrace it. Use these strategies to eliminate pain and discomfort from your practice of frugality. A version of this article originally appeared on GradHacker. Sacrifice, by definition, is not fun. The key to embracing frugality rather than tolerating it is in identifying your motivation for practicing it. What life values is your frugality helping you fulfill? What are you able to do with the money that you free up through practicing frugality? Personally, I wanted to handle my money responsibly. Being responsible is very important to me (eldest child much? ), and when I started grad school that translated into living within my means, being financially independent from my parents, and starting to save for retirement. I learned to practice frugality in each of my budget categories, and it was satisfying because I believed that in doing so I was becoming more responsible. Money that I no longer spend on my everyday living expenses could be put into savings. A couple years into grad school, I realized that traveling to see family and friends had also become very important to me. Finding a new way to be frugal in my monthly budget meant that more money was freed up to be added to my travel savings account. Making a sacrifice like canceling cable or ceasing eating out for convenience was made easier because I knew that the money would directly be put toward travel. 2) Widen Your Exposure to Frugal Strategies. Not every frugal strategy you come across is going to work for your life; you can’t expect to happen upon a new frugal idea once every few months and implement 100 percent of them to fantastic success in your budget. Instead, you should expose yourself to lots of suggestions, knowing that you might only pick up on and start practicing a small fraction of them. In fact, you might even reject a frugal tip the first time you hear it, but cycle back around to trying it out a few months or years later when something in your circumstances or disposition has changed. 3) Keep a Lid on Your Large, Fixed Expenses. When students start practicing frugality, they usually first turn to areas such as their food spending (a variable expense). However, the most effective and least onerous area of your budget in which to practice frugality is your large, fixed expenses. When you make a frugal choice in your large, fixed expenses, you lock in a rate that works well for your overall budget, meaning that there is less need to frugalize your remaining variable expenses, which require more willpower. Your large, fixed expenses will almost certainly include your rent/mortgage and car payment (if you have one), but might also include your insurance premiums, certain utilities, childcare, etc. Finding and moving to an inexpensive home or shopping for and buying an inexpensive car is not easy, but it is a one-time decision that will pay off every single month in perpetuity. 4) Focus on Habit Creation in One Area at a Time. The next best thing after reducing a fixed expense is to create a habit that reduces a variable expense. It’s very taxing to continually have to force yourself to practice frugality in a certain area, but once the practice becomes a habit, you do it effortlessly. So when you try out a new frugal tip, give it some time – a few weeks, perhaps – before deciding whether you’ll stick with it or not. The practice should become easier and easier as the habit becomes ingrained. Over time, you’ll also figure out how to best fit the frugal tip into your life; this might not be obvious the first time or two you try it, so don’t give up too quickly. It’s not a great idea to try to frugalize every area of your spending simultaneously. It will take a lot of effort to remember all the new frugal strategies you have in play, and it will be exhausting and possibly time-consuming to take on so much at once. Instead, focus on creating one new frugal habit at a time before moving on to the next one. The download includes 30+ frugal tips for PhDs-in-Training with links to video and additional written content. You'll receive 1-2 emails per week to help you make the most of your money during your PhD training. I think we’re sometimes reluctant to try a new frugal strategy because we can’t imagine practicing it indefinitely. But you don’t have to make a binding commitment to every frugal tip you try out. I like to think of trying out a new frugal tip as a 30-day experiment. If you have been tracking your spending, you know how much you spent in the relevant budget category before implementing the tip (your control). Then, commit to practicing the strategy for just 30 days, noting how much less money you spend and how onerous (or not) you found the strategy. At the end of the month, evaluate whether the cost savings were worth the effort expended to decide whether to continue with the strategy. 6) Talk Openly with Your Peers about Frugality. I recommend that you talk with your peers about money, specifically about your frugal aspirations. First, this reveals to your peers that you are money-conscious and not likely to be a big spender. Frankly, this will probably come as a relief to most of your peers who are on just as tight a budget as you are. It helps to set the expectation in your social circle that entertainment and socializing will be accomplished without a large price tag. Second, your classmates are going to be your best source of frugal tips, even better than the frugal wizards you can find online. This is because they have intimate knowledge of your university, your city, and your salary range. The first time I facilitated my workshop, Hack Your Budget, I was pleasantly surprised at the large number of frugal tips the participants shared with one another that were specific to their university and city – down to at what time and in what building a not-overtly-advertised pop-up discounted produce market operated. There was no way that an outsider like me could have generated that volume of frugal suggestions that were perfectly suited for that audience; it had to be crowd-sourced from a group of graduate students. The core purpose of frugality is to minimize your monetary expenditures in areas that matter less to you so that you can redirect your money toward areas that matter more. Therefore, the areas of your spending that you try to frugalize (and how you use your money instead) is unique to you. It takes time and effort to develop that frugal fingerprint, but the end result should not feel difficult or uncomfortable.